Greg Morrison is out of contract at Ross County at the end of the season. Greg Morrison is unfazed by the uncertainty over his future as he aims for a late play-off push with Elgin City. Morrison has been told by parent club Ross County that he will be released in the summer and he wants to finish the League 2 campaign on a high before deciding his next move. 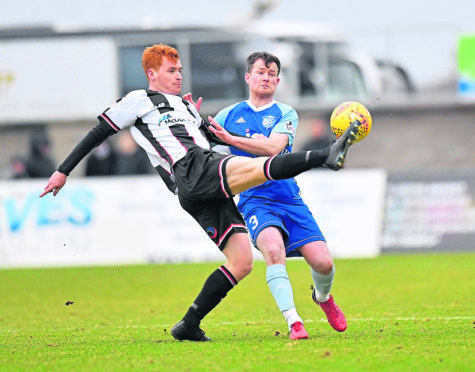 There has been interest in the Keith-born striker, who made nine appearances for the Staggies after Jim McIntyre handed him his debut against Aberdeen in January 2016. He spent last season on loan at Dumbarton as they suffered relegation from the Championship but this season has been altogether more positive, with Morrison scoring at Hampden Park, playing in the Scottish Cup at Easter Road and filling a multitude of roles for Gavin Price’s side. Morrison said: “There’s been interest in me but I’ve not looked too much into it. I’ve been told I’m getting released at the end of the season, they have made that clear, so my future lies elsewhere. But I’m focusing on the here and now. “It’s always reassuring and gives you a bit of confidence when teams are interested but I want to let my football do the talking. I’ve been playing in a few positions – striker, right midfield, left midfield, right-back – and it’s been a big learning curve. I’d been a striker all my days until I turned professional. The Borough Briggs outfit travel to Hampden Park today to face Queen’s Park, where Morrison scored in the same fixture in December during a 4-0 win for Elgin. Victory against the Spiders, who were relegated from League 1 last season, is a must if Elgin are to catch Annan and remain in the play-off hunt.